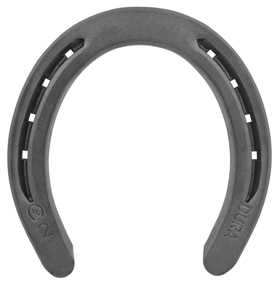 This 3/8” thick generic shape shoe uses a high grade steel and good carbon content for extended wear. The Dura Plain meets the needs of horses working in rough and abrasive terrains. The shoe is available in a symmetrical shape with no front and hind. Punched for city and slim blade nails. 1-14 $4.20/pr. 15-44 $4.00/pr. 45+ $3.85/pr. 1-14 $4.70/pr. 15-44 $4.45/pr. 45+ $4.30/pr. 1-14 $5.00/pr. 15-44 $4.75/pr. 45+ $4.55/pr.